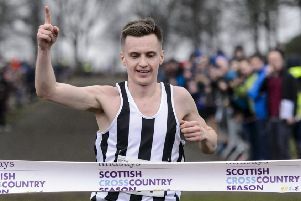 The 28-year-old from West Linton, who has switched up from the 1,500m this winter, galloped clear of training partner Andy Butchart to take victory in 7:52.86. Both Scots are coached by American Terrance Mahon. Lasswade’s Guy Learmonth secured his European spot following a two-hour wait. 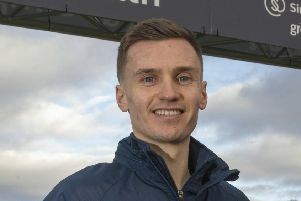 He missed out on automatic qualification when he came third in the 800m but was promoted into second when original victor Jamie Webb was disqualified after a lengthy appeal. Edinburgh AC’s Emma Nuttall was satisfied with fourth place in the high jump as her comeback to the sport after a knee injury continued, clearing 1.80m to just miss out on the podium on a countback tie-breaker with fellow Scot Nikki Manson. “That’s the best I’ve felt since I came back,” the former British champion, 26, said. “I just need to keep jumping and keep building on this. I’ve got one more indoor event in Athlone on Wednesday and then the hard work begins for the summer.” Lynsey Sharp faded to fifth in the 800m with Shelayna Oskan-Clarke retaining her title. Elsewhere, Josh Kerr, forced to sit out the Europeans due to university exams, grasped fourth place in the Wanamaker Mile in New York in a personal best of 3:53.65, leaving him behind only Peter Elliot and O’Hare on the all-time UK indoor rankings.